CHOOSING a Credit Card Payment Processor is one of the most important decisions you can make for the security and operation of your business. The relationship that you have with your Credit Card Provider not only affects the financial flow of payments that support your company, your Credit Card Provider is a direct link to your customer and the security of their finances and payments. We can now handle all of your Point of Sale needs from the POS to the Credit Card Processing - from Front of House to Back of House! - INNOVATIVE TECHNOLOGY Our groundbreaking payment solution delivers traditional and mobile payment acceptance (Credit, PIN Debit, Sig Capture, EMV, NFC and QR/2D) from a universal commerce solution. 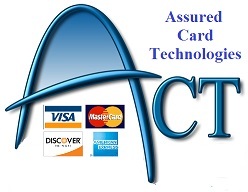 - SECURITY Assured Card Technologies incorporates leading edge encryption and secure technology in our software. Each of our payment solutions helps you achieve and maintain PCI compliance. - PERSONAL SUPPORT Our dedicated and highly trained in-house customer service and technical support staff is available to answer your questions 24/7. You will talk to someone who knows your business and understands your specific needs. Let Us show you how much you can save with our Integrated Credit Card Processing. Call and speak with Joe, Lee, Michelle or Frank Get an Application Today! Clcik the link below to send a Quick Email! We have evaluated and tested many Credit Card Payment Processors over the past 15 years. The market is constantly changing as new forms of payment are introduced. Some companies only process Credit Card transactions, others handle EBT, State Lottery and other forms of payment. In some cases the payment processor offers enhanced reports and customer dashboards. With some Credit Card Providers we have the option of offering Bundled Point-of-Sale hardware which can be automatically deducted from your weekly or monthly deposits, There is also an Option for Credit Card Cash Advances based upon your sales. Below is a list of our Preferred Partners in Credit Card Processing. We offer you Choices, not only in Point-of-Sale but also in your Credit Card Providers. We recommend that you choose no more than 2 or 3 to compare rates. Why should you choose one of the most important aspects of your business at random? We know these payment processors and more importantly - We TRUST these Credit Card Payment Processors to 'do right by our customers'. The companies listed below are in no particular order. Whoever you choose to Contact let them know that you were Referred by 'ACT-POS' for the Best Rates available!